When we talk about compact pistols chambered in .25 ACP, terms such as “backup,” “hide out” and “mouse gun” tend to work their way into the conversation. There’s no doubt the little .25 auto round is pushing it as a defensive round despite that fact the diminutive cartridge has been around for more than 100 years. During this century dozens of other pistol cartridges have fallen into obscurity, however. I suppose the true reason the .25 ACP is still in production has not so much to do with the round itself, but with the pistols designed for it. One of the first .25 ACP pistols, the Browning Baby, was introduced as a vest pocket gun for the well-dressed and armed gentleman. Since that first micro-compact pistol was introduced, numerous gun makers have come up with versions of their own. Taurus is in this market with its PT-25 subcompact semi auto. I obtained one and worked it out; my review follows. The Taurus PT-25 is a semiauto, double-action-only (DAO) pistol built on a steel frame and chambered in .25 ACP cartridge. 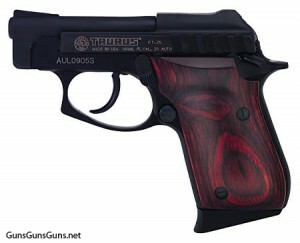 (Note: Taurus also offers this gun on a polymer frame, and in .22 LR.) A true subcompact, the PT-25 weighs only 12.3 oz. empty and has an overall length of 5.25″. The barrel measures 2.75″ with a 1:15 rate of twist. The PT-25 operates via a blowback action. It sports fixed, low-profile sights. A nine-round, single-stack magazine feeds the little pistol. While the pistol has a reciprocating slide, racking said slide is not the preferred method for loading. The PT-25 has a tip-up barrel, and for good reason. You see, the slide is rather small and difficult to get a good purchase on. Couple that with the fact that the DAO hammer rests against the rear of the slide, and loading the gun in a traditional manner proves all the more complicated. It’s much simpler to press forward on the lever on the left side of the frame to release the barrel, place a round of ammunition into the chamber manually and snap the barrel shut. With this step complete, you need only to load a magazine and press the trigger to fire the pistol. The PT-25 does have a magazine disconnect safety. In addition to the disconnect mechanism, the pistol also features a small, albeit redundant safety switch on the left side of the frame. And as they have for a decade, the folks from Miami have installed the Taurus Security System: Using one of two included keys, you can lock out the pistol to prevent unauthorized persons from using it. My sample pistol featured a deep blue metal finish and attractive rosewood grips. 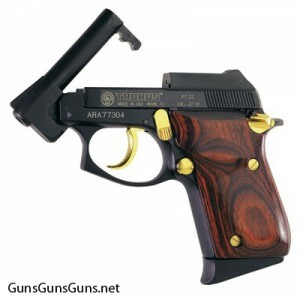 These wooden grips not only look good, they serve a valuable purpose in the filling the hand. Too many compact pistols have slim grips that give the shooter nothing to hold on to. The rosewood grips on the PT-25 allow you to take a solid hold on the pistol. A poor or weak grip is reliability poison for compact pistols. Note: Taurus offers this gun with a number of finishes (blue, nickel, twotone) and grips (checkered wood, rosewood, pearl, black pearl, etc.). Thirty minutes after picking the PT-25 up from Cook’s Gun Shop in Biloxi, Miss., I was out at the range. I took along several boxes of Hornady .25 ACP ammunition and a Bullet Test Tube. This is a defensive gun, so I didn’t bother to sit down at a bench. Shooting from a standing, two-hand hold, I was able to achieve some decent shot clusters while firing slowly and deliberately. I experienced a case of new-gun break in. During my first two magazines I experienced a couple of failure-to-seat stoppages. Both times I bumped the rear of the slide with the heel of my left hand. This fixed the stoppage. (You won’t be able to perform the typical tap-rack-reassess clearing on this little gun.) Fifty rounds later the issue had disappeared. With larger, more powerful handguns available, why would someone carry the .25 ACP? A couple of reasons come to mind. First, not everyone has the physical stature and ability to tolerate handgun recoil even from what many would consider mild rounds. I once knew a gentleman with arthritis so bad that he couldn’t stand the recoil from .38 Special or 9mm handguns. Does someone such as this not deserve to defend themselves? Second, the .25 is a small, easily concealable pistol. Sometimes our mode of dress dictates an ultra-compact pistol. I would rather have a small pistol on me when I needed one than a large pistol in the safe at home. A compact pistol such as the PT25 is not one that you will use to locate, close with, and destroy the enemy. Think of the pocket pistol as an E&E (i.e., escape and evade) gun. The pocket pistol is a weapon to buy you time to get out of the line of danger. Whatever firearm you choose to carry to defend yourself, keep in mind that your determination to win, your winning mindset, is most important. During this review, I wanted to see just what I could reasonably expect from a controlled-expansion round in .25 ACP. The Hornady defensive load featured a 35-grain XTP bullet. From a distance of 5′, I fired a round into the Bullet Test Tube material. Upon returning home from the range, I cut the tube in half and retrieved the projectile. It had traveled just a hair past 4” in the material and expanded as advertised. Keep in mind that Bullet Test Tube material is denser than Ballistic Gelatin. I used a digital scale and caliper to check the fired bullet. The XTP projectile weighed in at exactly 35 grains. You can’t ask for more than 100-percent weight retention. As for expansion, the caliper showed 0.345″ across. This isn’t monumental, but the bullet ended up larger than it started, and that’s what controlled expansion rounds are supposed to do. Although the PT-25 might be small, I found that after it was broken in, it was indeed reliable and easy to control. Though it might not be my first choice for a defensive sidearm, I wouldn’t begrudge someone from carrying this little Taurus pistol if it was the primary option. Until next time, keep shooting straight and shooting safe. This entry was posted in .25 ACP, $25-$250, Semiauto, Subcompact, Taurus and tagged Handgun Reviews on January 30, 2012 by Paul Markel. Nothing but problems for me. You name a failure I experienced it. Sounds like I am not the only one, although I have seen forums were people swear theirs works great. My failures to feed never went away. I finally got rid of it because it was more trouble than it was worth. This is a great lil gun. i personaly have always like the 25 acp and this gun shoots them well. Most people who have issues with this gun should try using Winchester 50 gran FMJ. They feed the best and for deffence with a round this small you want penatration. hollow points and other fancy rounds are just a wast of you mony. In ballistics gell a Win 25 FMJ will penatrait 12in. I love this little gun! 150 rounds through it with no problems at all. I do use a BABY LULA to load the mag as my big/old hands have trouble with the smaller calibers. I agree with Steve on the use of FMJ. Great purse gun for my wife as she has trouble racking slides and the popup barrel eliminates that. Engaging the Taurus Security System. I watched a shop turn the Security System Key when the Slide was open and Barrel tipped up. When questioned about potential damage, I was advised that just this one time would not cause any problem. Anybody know if this is probably okay. Worked fine except I had the same problem, 2 failures to go into battery. Just a tap on the slide did the trick. Obtained this little gun after an aborted home invasion attempt. I have fired off 50 rounds with no problem with the seating of next round. I am an elderly woman and can no longer handle a large weapon. This Taurus gives me peace of mind that if I am in reach of it in my home, I will inflict serious damage if not death. I do have two issues with this piece however: Being a tall person with a large hand, I find that after emptying the magazine I have a deep abrasion at the base joint of my thumb where contact is made with the base of the safety upon recoil. And, gradually after each magazine load the clip dropped a little where now there is a 1/16 gap all around between the bottom of the grip and the edge of the magazine which should be flush with it. But, none the less, I appreciate the feeling of confidence knowing that I can both pick up this weapon and drop the safety at the same time with my thumb as it is seating into firing grip. I not have to fear fumbling for a safety hard to find or access in the case of an emergency. I have only shot 80 rounds through my PT25,however,this pistol was utterly reliable and easy to shoot for a novice like me. I have owned the older model of this pistol for a number of years and have found it to be very accurate and completely reliable. I have never had a failure of any kind in it no matter what type of ammo I have used. And when I decided to see exactly how accurate I could be with it I was greatly surprised with it’s “spot on” targeting. Unfortunately some professional car break-in thieves got my car and 11 others in our neighborhood. The Taurus was in a locked glove compartment which they destroyed when they opened it with what must have been a small crowbar? I’m in the market for a new one because I have realized that it suits my purposes exactly. I bought a Taurus PT111 and it is so bulky and so much trouble to hook onto my belt for an inside carry I frequently leave it at home. I thought it was the answer to my carry gun needs and it’s not. I also don’t like having to wear a shirt of some kind over my T shirt in the Summer so the pistol doesn’t show. I much preferred it when I could just reach up to the bookcase by the door and pick up the PT25 and slip it into my pocket. THAT I will do while carrying a heavy and uncomfortable 9mm is NOT. I realize that in a firefight I may be underpowered. But my goal is to buy some time while I look for an escape and pray that the noise and activity is attracting some help. I’m not trying to win a war, I am trying to turn tail and run. I believe that as loud as the PT25 is I can accomplish that goal. I do know that I am better off carrying the PT25 than NOT carrying the PT111. Anyway, that’s my situation and my thinking on the subject. I welcome any comments and ideas others may have as long as they are offered in a helpful and friendly manner. G’day.